At Oberlin, you see this question everywhere -- splashed across the posters of admissions and asked (often ironically) by philosophy professors. There’s even a great origin story behind the slogan, and I’m not the first blogger to weigh in on Oberlin’s unofficial motto. As of right now, I don’t know. I’m waiting to hear back from different programs, and considering new opportunities for the future. 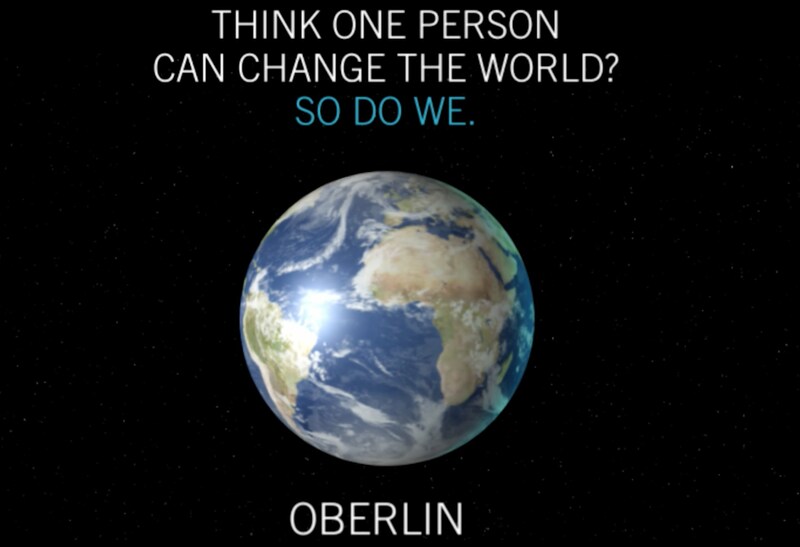 When I think about changing the world, though, I think first about my own world at Oberlin: how big and scary it seemed as a freshman, and how much more comfortably I navigate it now as a senior. I still don’t know if one person can change the world, but I know that one person has changed mine. I’ve met many “Ones” at Oberlin, and they weren’t always the people I expected them to be. Take Mike, for example. Mike was the janitor who worked in my freshman dorm, Dascomb Hall. Our friendship developed slowly and was sustained largely by each of us asking, “How are you doing today?” when we saw each other at 6:45 in the morning, Mike beginning his cleaning rounds for the day, and me getting ready for my morning workout. It’s a simple question, but Mike always asked it with genuine interest. When he found out that I run track and field for the college, he asked to know when we had home meets and then showed up to cheer me on. He’s moved on from Dascomb to work for transportation for the college, but I know that I’m not the first freshman that was touched by his kindness. He made Dascomb feel welcoming, which can mean a lot to a freshman far from home for the first time. My freshman year track and field coach was a One, and also the first person at Oberlin to believe in me without reservation. At my first meeting with Coach Hudson, he drew a big “59” on a sheet of paper to indicate he expected me to break 60 seconds in the 400m. I hadn’t ever come close to the time and laughed at this idea – but before each race I remember the confident scrawl with which he predicted my times. At our very last conference meet I finally did it, three times in one weekend and claiming all-conference honors in all four of my events. He wasn’t able to coach me past my first year, but two All-American trophies later, I still credit him with giving me the confidence to step on the line and bring my best. When I was struggling to adjust to Oberlin my first semester, I wrote a to-do list of “action items” for myself to try in an effort to make Oberlin feel more like home. First on that list? “Get coffee with Nuria.” Nuria was one of the seniors on the track team that I met in the fall semester who was in my workout group. We spent a lot of time training and competing together, and she was one of my first friends at Oberlin. Nuria and her housemates opened their home, “the Bungalow,” on North Professor Street, to me. It was a space for all sorts of activities -- smores making, venting about a long day, or doing homework. Nuria was always there for me when I was anxious before a race, and always there to listen when I was in my post-race, endorphin-fueled state. Having an upperclassman to guide me through my first year of Oberlin was unbelievably crucial to my feeling comfortable and supported at Oberlin. I found another friend in my first semester politics TA, Taiyo, whose weekly meetings I always looked forward to and who assured me everything would be okay when I got my first bad grade on a paper in college. This connection introduced me to someone who could give me advice about choosing classes, applying for fellowships, and general campus culture. Of course, some of the Ones who were the most formative for my academic career were my professors. I was fortunate enough to be placed in a Spanish 101 class with Professor Kim Faber my first semester, and her excitement and passion for the subject inspired me to work more diligently than I ever had in a class before. I fell so in love with the study of the language that I went on to study abroad and pursue more classes in the department, and ended up becoming a Latin American Studies major as a result. When I found myself drowning in assignments and struggling to balance my life as a student-athlete my junior spring, it was my Latin American Studies advisor, Claire, who came to my aid. I had always imagined myself completing an Honors thesis at Oberlin, but when the deadline for a proposal came around, it was in the thick of my track and field season. Claire advocated to the department for me to extend deadlines in order to give me time to develop a better proposal. It was a windy road, but I finally was accepted to the Honors program in the fall after Claire encouraged me to repurpose a grant proposal I had written for a post-graduate fellowship into an honors thesis. My honors advisor turned out to be Yago, and he wore many hats for me this semester. He agreed to take me on as an advisee despite it being his first semester teaching at Oberlin, and he also invited me to contribute to the Sports, Culture, and Society cluster as a teaching assistant. The mentorship and freedom that Yago has given me as an advisor this past semester is allowing me to write a thesis that I really care about; it not only synthesizes a variety of my academic interests, but lets me write about some of my most impactful life experiences, like my time abroad training and studying in Chile. Yago, Claire, and Kim are just a few of the professors I’ve had at Oberlin whose passion in their fields has been contagious for me; they are the Ones who taught me to be unafraid in my thinking and relentless in my pursuit of learning. I am not just a better thinker because of them, but a better, and frankly, more interesting, person. What I’ve learned at Oberlin is that it’s not only how you treat other people that matters, but how you approach your everyday life. The people who inspired me and shaped me into the person I am at Oberlin today did it not just through their words and actions towards me, but in the way they exuded kindness, empathy, and positivity in their smallest interactions. As I said, I still don’t know if one person can change the world. I do know that one person has the power to change the day, and sometimes even the life, of another. And sometimes, that power comes from a simple smile and genuine “how are you?” You never know whose world you might change.